← Eric Holder Presents Finding of Both DOJ Ferguson Investigations (Video) – #1) Officer Darren Wilson, and #2) Overall Ferguson Police Dept. TX, needed a grin. Sounds good to me! 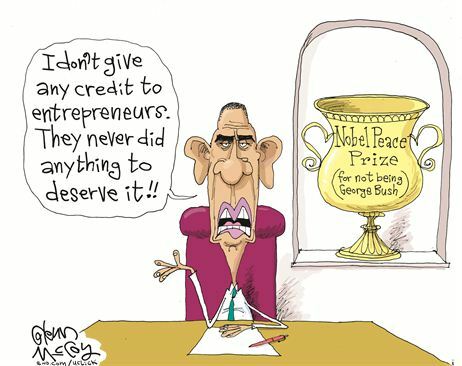 Obama won a Nobel Peace Prize. Heck, since he writes most of the material used in all the mainstream media, shouldn’t he receive a Pulitzer. too? He should receive not only a Pull-itzer but a ZJ from ‘Pinch’ Sulzberger as well. Oh, and by the way, I absolutely love that sign. What a perfect representation of the triviality of not only Obama’s Nobel but the Nobel prize in general. Kudos to that clever rerestaranteur. Wow, did I blow that spelling of “restaranteur” or what? Not even spell check could save me on that one. My apologies to the educated masses of the Tree house. 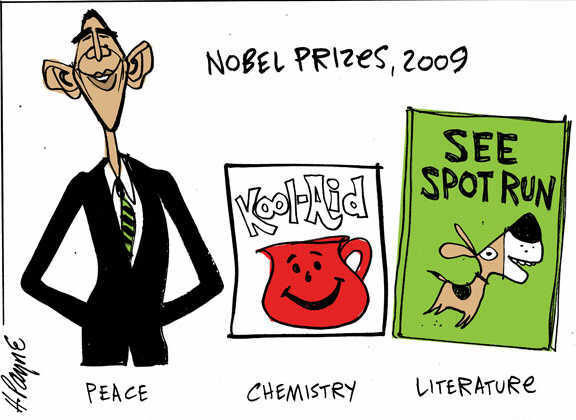 Is it possible that the Peace Prize was for sale? Or was Thorbjorn whatever his name is demoted because he made bad choices as to recipients? I’m guessing the prize for Physics went to the Chinese fingertrap. FDR you are really on a roll..
Possible five years for Elijah Cummings (D-MD). Nahh! 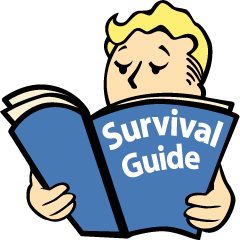 As powerlineblog noted “Laws are only for peons like Petraeus….” and the rest of us. America may be in bad shape, but we haven’t lost our sense of humor. This needs to be forward to John Kerry who thinks he should have had the Peace Prize a long time ago.